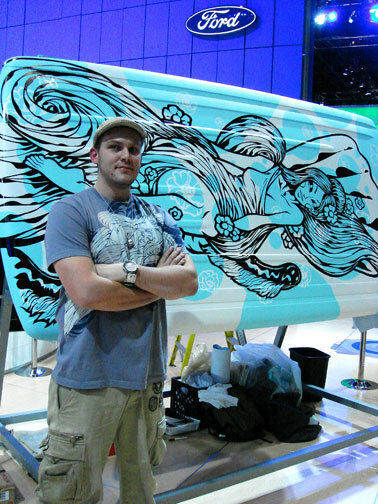 Following Tristan Eaton's crossover painting on Ford Flex roofs at the Chicago Auto Show, Sket One a joined in on the action at this weekend's New York Auto Show. Sket put in long hours working on one roof per day (Th - Sat), three in all, with some assisancet from Cers One. Each piece was a combination of painted elements and applied vinyl provided by Pon. Tristan did three orange, blue and purple pieces that you can see mounted high above the convention center floor in several of the shots. Props to Sam DeWitt for the nice shots. Click through for a full gallery. With the release of the newly designed Tokidoki LeSportsac bags , here's a few shots of what went down at the LeSportsac party in Hong Kong. From the looks of things, Raymond of Toy2R sure was having a g'd old time with the Tokidoki's models!! I can feel the heat...sizzling hot hot hot!!! 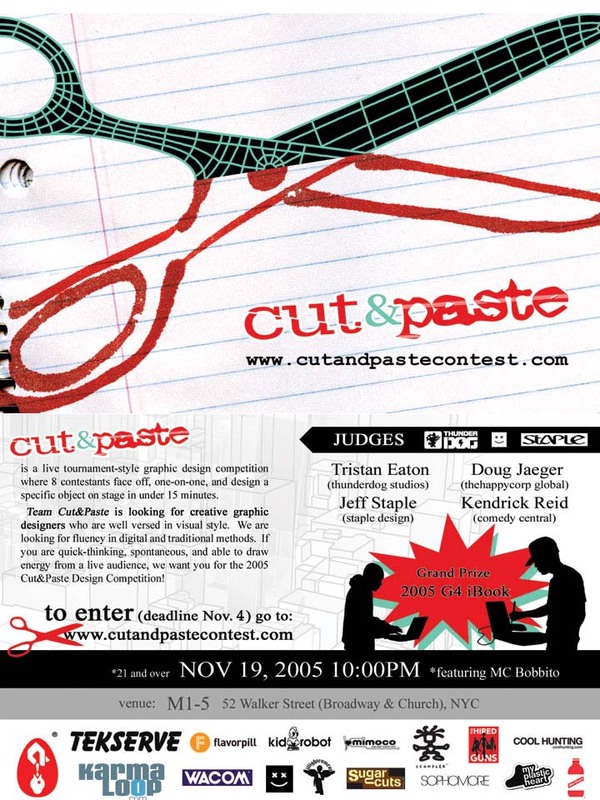 The Cut & Paste graphic design competition will be held on November 19th @ 10 PM at M1-5 (Tribeca, NY). Hosted by MC Bobbito, Cut & Paste will feature a tournament style arrangement pitting eight competitors head to head with a maximum of 15 minutes to work on an assigned design theme. The crowd will be able to view the competition up close and personal through large projection screens. 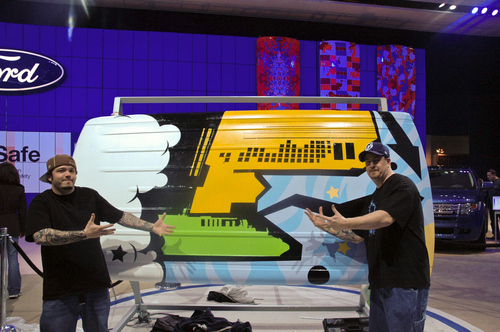 The idea is based on DJ Battles but instead of DJ's spinnin' it'll feature graphic designers armed with Mac G5's, Wacom tablets and such. The competition will be judged by Tristan Eaton (Thunderdog Studios), Kendrick Reid (Comedy Central), Doug Jaeger (thehappycorp global), Jeff Staple (Staple Design). All eight contestants will receive a cool gift bag, the semi-finalists will also receive a whopping 2GB Mimobot from Mimoco and the winner will receive an Apple iBook for his or her dope under-pressure designs. Cut & Paste seems like a pretty innovative idea whose time has come. Designer toys are one canvas and outlet for talented designers to get their work seen, appreciated, purchased and enjoyed. Competitons such as Cut and Paste will likely raise the bar for top-notch graphic design and by extension designer toys as well. 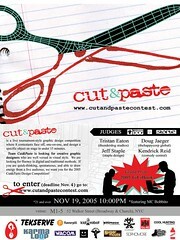 For more info check out www.cutandpastecontest.com.